If you’re looking to sell your home, start the staging process months ahead of time. While a simple flower arrangement is beautiful on your kitchen table, proper staging is much more complicated than that. 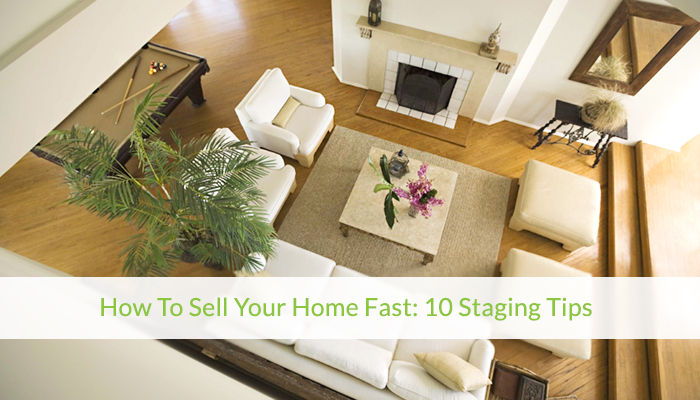 Follow these 10 staging tips to help get your home on the market and sold in record time! When was the last time I used this item? If so, how often? Is this item broken? If so, is it worth fixing? Once you’ve decided on what to keep, throw away, donate or sell you can move to the next steps in the staging process. If you have simply outgrown your home and have many things you’d like to keep, consider renting a storage unit during the showing process. The last thing any seller wants is an inadequate inspection. Avoid this altogether by making minor and major repairs in the months leading to the sale. Start with major repairs first then dive into smaller more pesky repairs. Think of concerns you had when purchasing your home and address accordingly. This step should go without saying, but it never hurts to remind ourselves to go the extra mile. Even if you clean your home on a daily basis, things are bound to slip your mind. Start from the outside and move in. Clear your furniture of keys, purses, hats, gloves, etc. Don’t think people will not open each and every cupboard in your house. They want to know what sort of space they’re working with so be sure to keep things clean and organized. Keep in mind that each home is different, so address each and every nook. Now that the entire home is sparkling, it’s time to delve into the rest of our staging tips! If you’re already struggling for square footage, the last thing you want to have is large furniture in tight quarters. If you’re able to move large pieces into storage, go for it! Storing these pieces helps to open up tight spaces. If you usually use two large couches, consider removing one of them to display the square footage instead of overcrowding a small space. It's also important to restore rooms to their original purpose. If you've turned the office into a playroom, do your best to return it to an office. When a potential buyer enters your home, you want them in instantly envision their families living there. If your family photos are staring them in the face, they feel like a guest in someone else home. First thing is first, remove all pictures on walls and tables. If you have a beautiful picture collage, consider placing decorative wrapping paper in your frames instead of your family pictures. This makes it easier to envision their families in the frames while keeping your design intact. Don’t forget to remove photos off of your fridge as well. This process doesn’t just involve photos. Be sure to put away personal items away as well. This includes anything from bathroom essentials to dirty laundry. If your favorite color happens to be bold, consider introducing it as an accent color instead of your overall wall color. Many people will struggle to see the beauty of a room if they can’t get past the color choice. For example, it will be hard for any buyer to get past the bold choices in this English home. Bold choices like this could cause you to reduce your asking price. Consider painting rooms light, neutral shades to please any future home buyer. Lighter paint colors also help to trick the eye to think rooms are larger than they are. A great yard is always a huge plus on any home buyer's checklist, especially since it’s the first thing they see when viewing your home. Here are several easy ideas to make a great first impression on your potential buyers. Add new mulch to your flower beds. Dig up dead or dying plants. Clean up pots and planters. With that much time spent outdoors, they’re bound to accumulate dirt and grime over time. Add some color to your flower beds to brighten up your yard. While we all love our pets, not everyone wants to be greeted by Fido at the front door. Whenever you have a showing, plan to take the pets with you. If you have multiple showings in one day, consider taking your dog or cat to “daycare.” This way you’re not taking time away from your busy schedule to let the pets out several times a day. Don’t forget to remove any unsightly and smelly pet evidence as well. One of the biggest things to remove or hide is the litter box! In our day to day life, we keep lights off in unoccupied rooms and close our blinds for privacy. During a showing, you want to do the complete opposite. Make your home as bright as possible! First, open up all blinds and curtains to allow as much natural light in as possible. Second, turn on ALL lighting in your home. This gives you a chance to showcase your home and lighting fixtures. This includes outdoor lighting if applicable. If you have a room in the house that is dimly lit and allows little to no natural light in, purchase several inexpensive lamps that will help to illuminate the space! Consider the following to help set the brighten the overall mood as well. Each time you have a showing, run through a predetermined checklist. Give one to each member of the family to help from feeling overwhelmed. Wipe down counters, tables & bathrooms. If you’re in a time crunch, plan to toss clutter in a laundry basket or box to take with you in the car. That way you don’t waste time putting things away when you could be cleaning an unsightly kitchen mess instead! Hooray - Your Home is Staged! Now that your home is properly staged, you’re ready to put it on the market! Contact Space Simply online or at (515)423-0899 today for all of your selling & buying needs!